Anyway, when it comes to books, I'm very much a browser. I couldn't count the number of times I've found shockingly good books just by looking around with no set goal, or discovered that a favorite author has somehow released a new book without letting me know. Once I even unearthed several books illustrated by an old high school buddy. So sure enough, one of my favorite authors has gone and slipped a new book past. But I found it, and it's a stunner. A bit more than five years ago I stumbled on a certain book of beasts. Not the Kansas one I may have mentioned before, but something called The Book of Barely Imagined Beings, by Caspar Henderson. I was gobsmacked, thoroughly enraptured by both the form and content of this inspired "21st Century Bestiary," as the subtitle had it. I'm surprised it didn't make more of a splash (though there is a recent pop-up version! 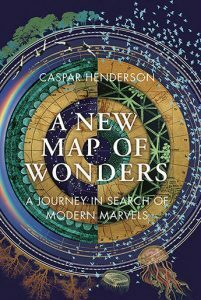 ), and I'm happy to report that Mr. Henderson is back with a companion compendium, called A New Map of Wonders. And a wonder it is. This one book is like browsing the entire nonfiction section of a large library. Plus, it's loaded with illustrations, marginalia, quotes, poetry, popular culture allusions, and a big bibliography and index. Far more nonfiction books should be illustrated and indexed. One immediately wonders, how does one present a book of wonders? Rather than an A-to-Z list like his Barely Imagined Beings, Henderson has twisted a "seven wonders" approach to embrace emergence, as he says, organizing his "map" with seven wonder-ful themes. (While he devotes some pages to discussing maps, the book itself is not a map, despite the title.) So we bounce along from Light and Life to Heart and Brain, thence to Self and World and Future. That about covers it, right? Well, in Henderson's capable hands and mind, it just about does. Notice I just used the verb "bounce," and not "proceed" or "move" or "trudge." As you might guess from the smiling author photo on the sleeve, Mr. Henderson has a deft touch and a sense of humor. Not to mention undaunted courage, to even take on such a project. As it happens, I was quickly drawn in to A New Map of Wonders partly because my recent readings have taken me far from my usual fare, muddling through physics and biochemistry and other heady stuff. But I have to say, in so doing I have learned about one of The Most Amazing Things Ever, heretofore unknown by yours truly. And there it was, described and illustrated in the "Life" section of wonders. Poking around in the hidden corners of the Map, I also learned of some of Henderson's friends and influences. His acknowledgments include writers Robert Macfarlaneopens a new window and Paul Kingsnorthopens a new window. He quotes Annie Dillardopens a new window, John Berger,opens a new window and Barry Lopezopens a new window, and Rebecca Solnitopens a new window several times. On his list of the five best books on science and wonder he cites Rachel Carsonopens a new window and Robin Wall Kimmereropens a new window, as well as Richard Holmes' The Age of Wonder, which I wrote about here several years ago. A brief review can’t do justice to the contents of such a book, but I hope I have expressed some of its flavor. Next time you’re browsing the shelves, head to 031.02 Henderson and sample A New Map of Wonders. —Jake Vail is an Information Services Assistant at Lawrence Public Library.